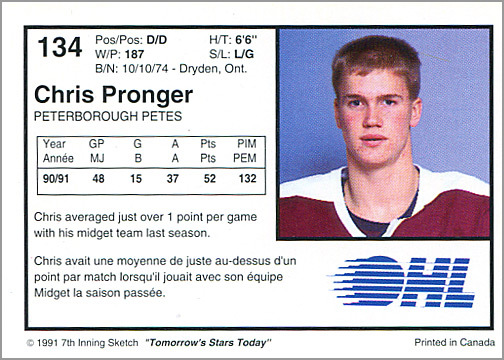 1991-92 – Pronger originally stated that he was going to play college hockey, but changed his mind after being drafted by the OHL’s Peterborough Petes. He played two seasons of major junior hockey. 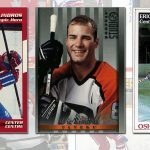 The back of his very first hockey card (shown above) lists Proger at a svelte 187 pounds — a good 20 pounds lighter than his eventual playing weight in the NHL. 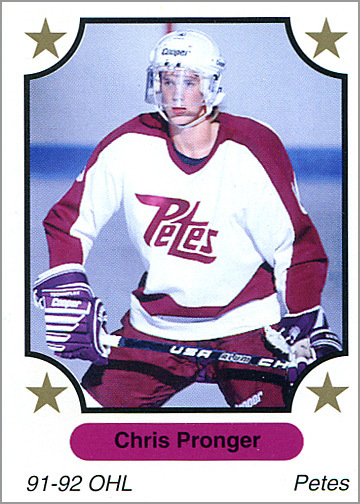 1992-93 – Pronger won the Max Kaminsky Trophy as the best defenseman in the OHL, and was an OHL First Team All-Star. He was also named the best defenseman in all of major junior hockey. 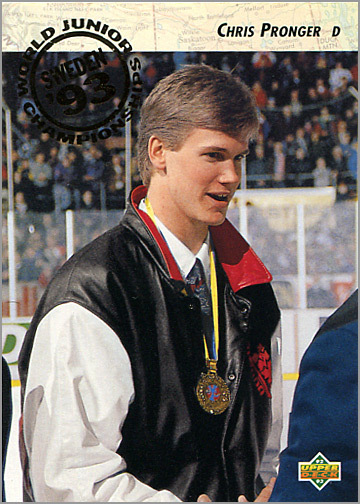 Pronger won a gold medal — as shown on his rookie card above — with Team Canada in the World Junior Championships. June 26, 1993 – In the 1993 NHL Entry Draft, Pronger was selected by the Hartford Whalers second overall. 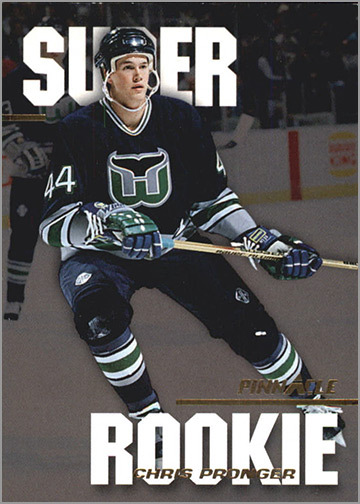 1993-94 – Pronger had a “super rookie” season with the Whalers, netting 30 points (5 G, 30 A) in 81 games. He was named to the NHL’s All-Rookie Team. 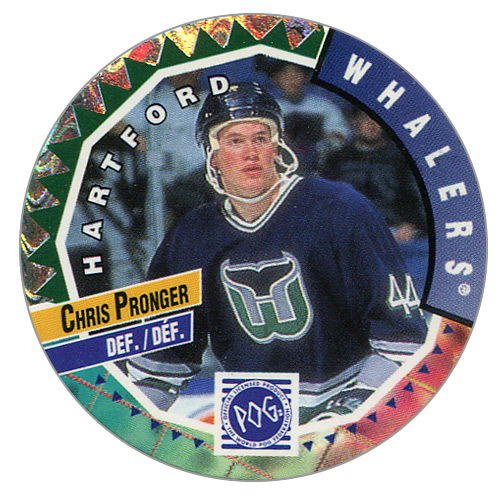 1994-95 – Not much to say about Pronger’s second year with a sad-sack Whalers team, other than he was featured on a Pog. Admit it — this Pog is the most “nineties” thing you’ve ever seen, considering the shiny foil, the Whalers logo…and the fact that it’s a freakin’ Pog! 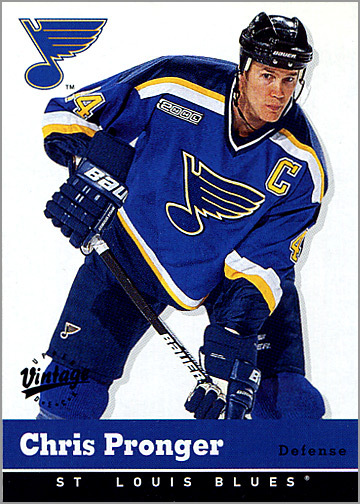 July 27, 1995 – After two seasons in Hartford, Pronger is traded to the St. Louis Blues for Brendan Shanahan. 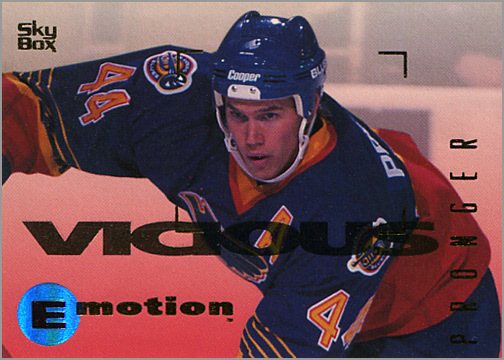 1995-96 – “Vicious” is a good word to describe Pronger’s first season in St. Louis, as he accrued 110 penalty minutes in 78 games. 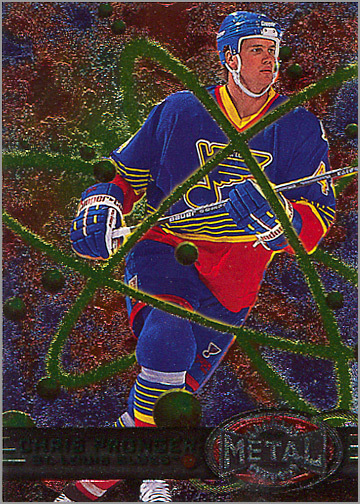 1996-97 – OK, this card from the Fleer Metal Universe set might be more “nineties” than that Pog from earlier. 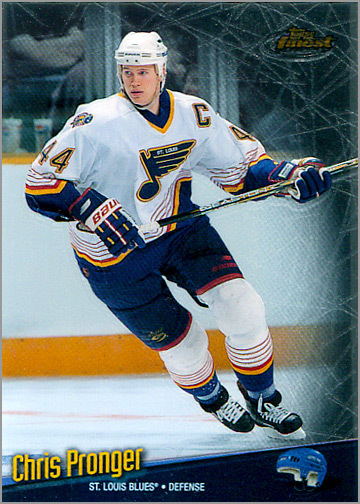 1997-98 – Just shy of his 23rd birthday, Pronger was named the youngest captain in St. Louis Blues team history. 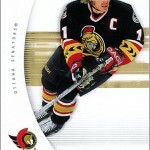 He played for Team Canada in the 1998 Winter Olympics. Pronger’s plus/minus rating of +47 was tops in the NHL, and he was named a Second Team NHL All-Star. 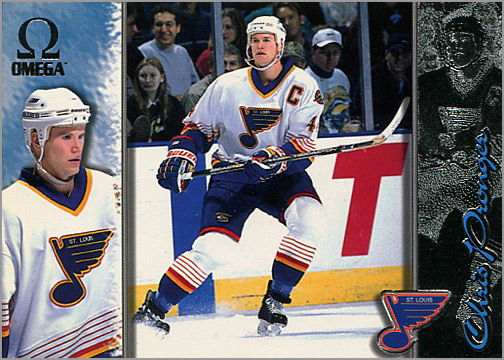 1998-99 – Pronger had another fine season, scoring a then-career high of 46 points (13 G, 33 A) in 67 games. He played in the NHL All-Star Game for the first time in his career. 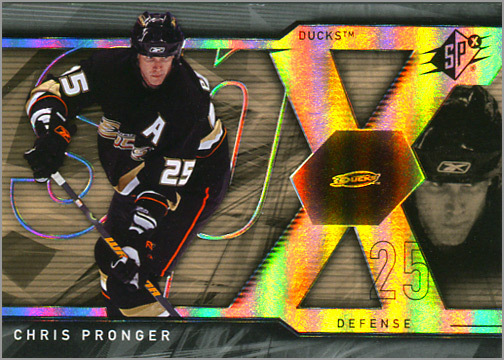 1999-2000 – This was Pronger’s best season. He won the Norris Trophy as the best defenseman in the NHL, and the Hart Trophy as the league’s MVP. He led the NHL in plus/minus with +52, played in the All-Star Game again and was named to the First All-Star Team at season’s end. He registered career highs with 14 goals, 48 assists and 62 points. 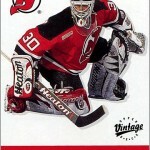 Oh, and he was on the cover of the video game NHL 2000. 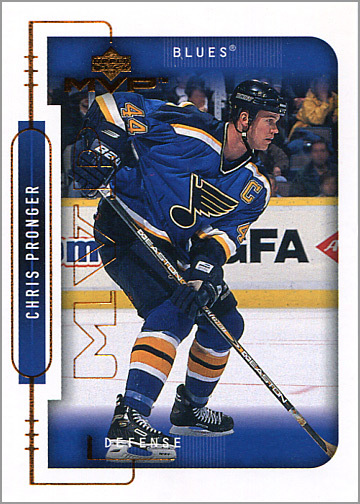 2000-01 – In an injury-shortened season, Pronger scored 47 points in 51 games. He was voted as a starter in the 2001 NHL All-Star Game, but was hurt and did not play. 2001-02 – Pronger played for Team Canada in the 2002 Winter Olympics and won a gold medal. He played in his third NHL All-Star Game, too. 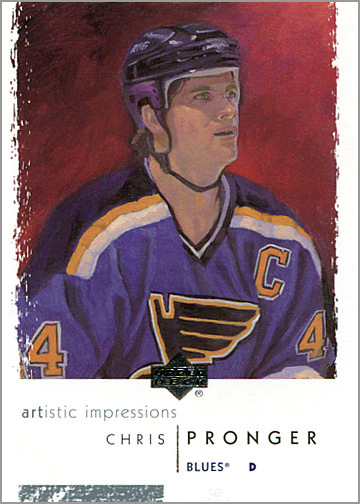 2002-03 – Injuries limited Pronger to just 5 games — but hey, at least Upper Deck made this sweet painting of him for their Artistic Impressions trading card set. He was also on the cover of the video game NHL Hitz 2003. 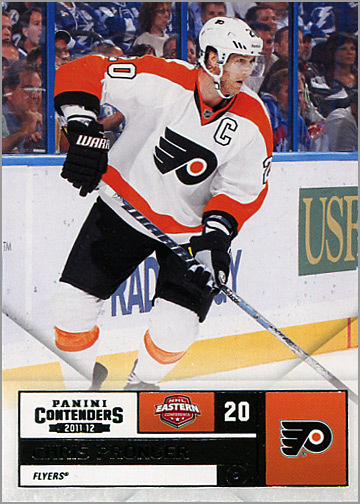 2003-04 – Pronger plays 80 games in 2003-04 and scores 54 points. He participates in the 2004 NHL All-Star Game, and is named to the NHL’s Second All-Star Team. 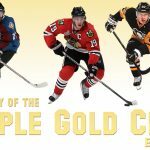 2004-05 – A lockout cancels the entire 2004-05 season. Unlike many other NHL players, Pronger does not bide his time playing in the minors or overseas. August 2, 2005 – As part of the agreement that ended the lockout, a salary cap is imposed. 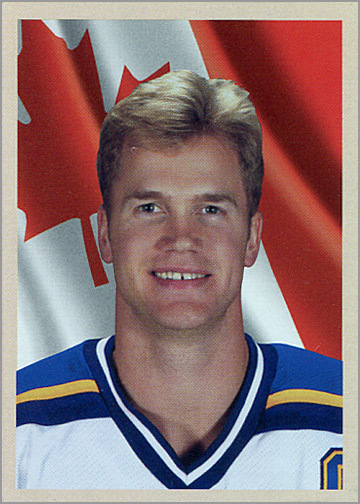 The Blues needed to shed salary, so Pronger was shipped off to the Edmonton Oilers for Eric Brewer, Jeff Woywitka and Doug Lynch. 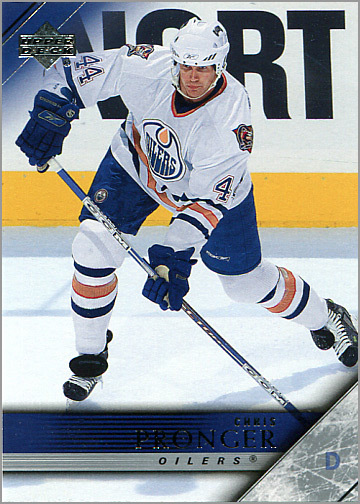 2005-06 – In his only season in Edmonton, Pronger led all Oilers’ defenseman in scoring with 56 points. 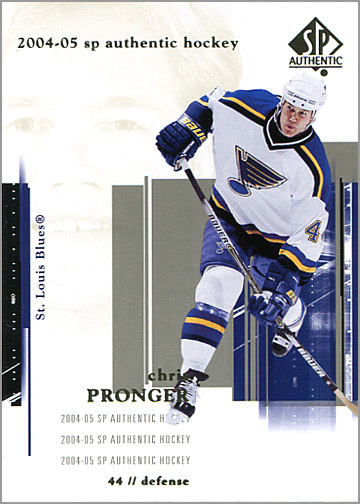 During the Stanley Cup Playoffs, Pronger led his team in scoring with 21 points in 24 games. The Oilers lost in the Finals in seven games to the Carolina Hurricanes. Pronger also played for Team Canada in the 2006 Winter Olympics. July 3, 2006 – After he has his agent request a trade, Pronger is sent to the Anaheim Ducks for Ladislav Smid, Joffrey Lupul, two first round draft picks and a second round draft pick. Edmonton uses one of the picks to select Jordan Eberle, but best of all, Pronger’s trade to Anaheim results in one of the greatest quotes by Ilya Bryzgalov. 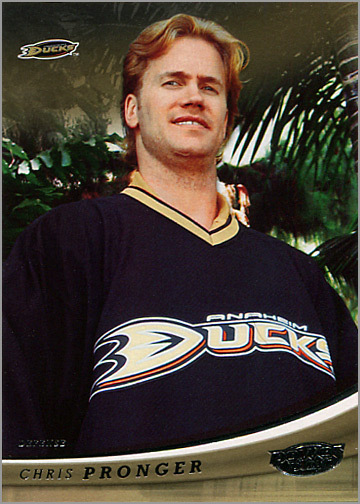 2006-07 – Pronger had a stellar first season with the Anaheim Ducks. He scored 59 points — second among Ducks’ D-men — in 66 games and is named a Second Team All-Star. Pronger also tied Teemu Selanne and Corey Perry for second in team scoring with 15 point during the 2007 Stanley Cup playoffs. The Ducks won the Stanley Cup that year, with Pronger and Scott Niedermayer anchoring the defense. 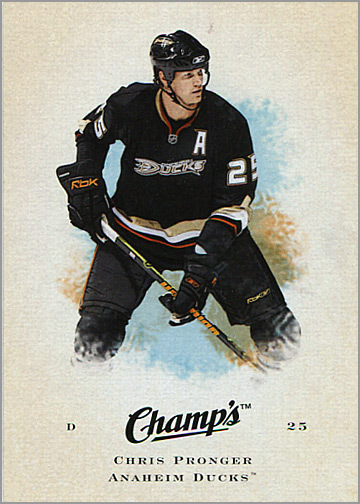 2007-08 – Pronger was named team captain of the Ducks, and led all Anaheim defenders with 43 points in 72 games. He also played in his fifth and final NHL All-Star Game. 2008-09 – For the first time in his entire career, Pronger played an entire NHL season. He appeared in all 82 games for Anaheim — including his 1000th-career game on February 20, 2009. June 26, 2009 – Pronger is traded for the fourth time in his career. The Anaheim Ducks send Pronger, along with minor leaguer Ryan Dingle, for Joffrey Lupul (again! ), Lucas Sbisa and two first round draft picks. 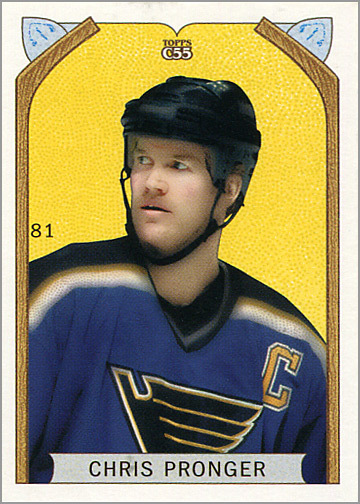 2009-10 – Pronger played another entire 82-game season. He was third on the Philadelphia Flyers in scoring with 55 points in 82 games. 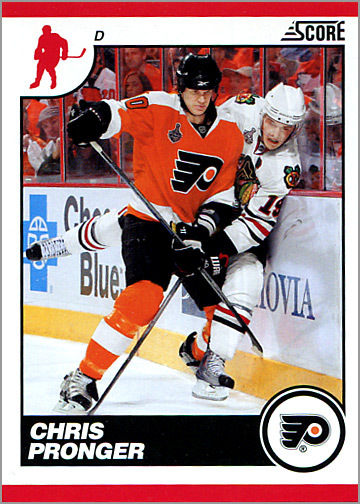 The Flyers make it to the 2010 Stanley Cup Finals, losing in six games to the Chicago Blackhawks. Pronger played for Team Canada for the fourth time in the 2010 Winter Olympics, again winning a gold medal. 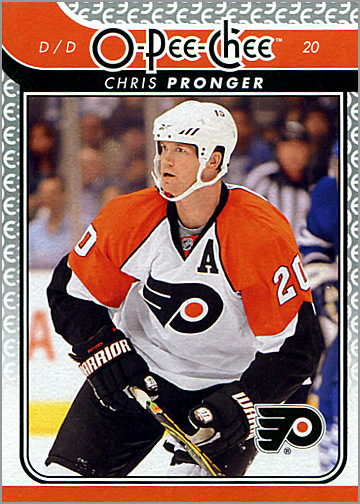 2010-11 – Injuries limit Pronger to 50 games, but he still put up a respectable 25 points. 2011-12 – Before the start of the season, Pronger is named team captain of the Philadelphia Flyers. This is the third time he would be the captain of an NHL squad. Unfortunately, an eye injury and post-concussion syndrome would end his career 13 games into the season. Yet, Pronger did not retire, instead opting to go on the long-term injured reserve list and collect the $12.15 million in salary through 2016-17. Had he retired, his full salary would have counted against the Flyers’ salary cap, since he was over 35. October 10, 2014 – Pronger is hired by the NHL in their Department of Player Safety. June 27, 2015 – Pronger and Nicklas Grossman are traded to the Arizona Coyotes for Sam Gagner and a conditional draft pick in a deal made primarily to get the Coyotes to the cap floor while giving the Flyers some cap room. I received my belated birthday gift, a Pronger flyers jersey, the day he had his eye injury. I can still remember hearing his scream come through the television. my stomach dropped. I thought my new jersey was jinxed.